For other uses, see Agitprop (disambiguation). Agitprop poster by Vladimir Mayakovsky titled: "Want it? Join"
Hasten to join shock brigades of exemplary labor!" Agitprop (/ˈædʒɪtprɒp/; from Russian: агитпроп, tr. 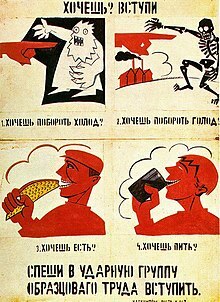 Agitpróp, portmanteau of "agitation" and "propaganda") is political propaganda, especially the communist propaganda used in Soviet Russia, that is spread to the general public through popular media such as literature, plays, pamphlets, films, and other art forms with an explicitly political message. The term originated in Soviet Russia as a shortened name for the Department for Agitation and Propaganda (отдел агитации и пропаганды, otdel agitatsii i propagandy), which was part of the central and regional committees of the Communist Party of the Soviet Union. The department was later renamed Ideological Department. Typically Russian agitprop explained the policies of the Communist Party and persuaded the general public to share its values and goals. In other contexts, propaganda could mean dissemination of any kind of beneficial knowledge, e.g., of new methods in agriculture. After the October Revolution of 1917, an agitprop train toured the country, with artists and actors performing simple plays and broadcasting propaganda. It had a printing press on board the train to allow posters to be reproduced and thrown out of the windows as it passed through villages. It gave rise to agitprop theatre, a highly politicized theatre that originated in 1920s Europe and spread to the United States; the plays of Bertolt Brecht are a notable example. Russian agitprop theater was noted for its cardboard characters of perfect virtue and complete evil, and its coarse ridicule. Gradually the term agitprop came to describe any kind of highly politicized art. Censorship of the press: Bolshevik strategy from the beginning was to introduce censorship over the primary medium of information in the former Russian Empire in 1917, the newspaper. Lenin took control of the socialist newspaper Pravda, making it an outlet to spread Bolshevik agitprop, articles, and other media. With the Bolshevik capability to censor and shut down newspapers of opposing or rival factions, Pravda was able to become the dominant source of written information for the population in regions controlled by the Red Army . Oral-agitation networks: The Bolshevik leadership understood that to build a lasting regime, they would need to win the support of the mass population of Russian peasants. To do this, Lenin organized a Communist party that attracted demobilized soldiers and others to become supporters of the Bolshevik ideology, dressed up in uniforms and sent to travel the countryside as agitators to the peasants. The oral-agitation networks established a presence in the isolated rural areas of Russia, expanding Communist power. Agitational trains and ships: To expand the reach of the oral-agitation networks, the Bolsheviks pioneered using modern transportation to reach deeper into Russia. The trains and ships carried agitators armed with leaflets, posters and other various forms of agitprop. Train cars included a garage of motorcycles and cars in order for propaganda materials to reach the rural towns not located near rail lines. The agitational trains expanded the reach of agitators into Eastern Europe, and allowed for the establishment of agitprop stations, consisting of libraries of propaganda material. The trains were also equipped with radios, and their own printing press, so they could report to Moscow the political climate of the given region, and receive instruction on how to custom print propaganda on the spot to better take advantage of the situation. Literacy campaign: The peasant society of Russia in 1917 was largely illiterate making it difficult to reach them through printed agitprop. The People's Commissariat of Enlightenment was established to spearhead the war on illiteracy. Instructors were trained in 1919, and sent to the countryside to create more instructors and expand the operation into a network of literacy centers. New textbooks were created, containing Bolshevik ideology to indoctrinate the newly literate members of Soviet society, and the literacy training in the army was expanded. Rusnock, K. A. (2003). "Agitprop". In Millar, James. Encyclopedia of Russian History. Gale Group, Inc. ISBN 0-02-865693-8. Vellikkeel Raghavan (2009). Agitation Propaganda Theatre. Chandigarh: Unistar Books. ISBN 81-7142-917-3. ^ Leshchenko, Svetlana (December 6, 2015). Modern Russian-English Dictionary. Lulu Press, Inc. p. 7. ISBN 978-1-329-74063-1. ^ The Editors of Encyclopædia Britannica Article (July 11, 2002). "agitprop". Encyclopædia Britannica. Encyclopædia Britannica, Inc. Retrieved January 29, 2017. ^ "Agitprop Train". YouTube. 2007-06-15. Retrieved 2009-05-09. Schütz, Gertrud (1988). Kleines Politisches Wörterbuch. Berlin: Dietz Verlag. ISBN 978-3-320-01177-2. Kenez, Peter (November 29, 1985). The Birth of the Propaganda State: Soviet Methods of Mass Mobilization, 1917–1929. Cambridge: Cambridge University Press. p. 342. ISBN 978-0-521-31398-8. Ellul, Jacques (1973). Propaganda: The Formation of Men's Attitudes. New York: Vintage Books. p. 320. ISBN 978-0-394-71874-3. Tzu, Sun (1977). Samuel B. Griffith (translator), ed. The Art of War. Oxford University Press. p. 197. ISBN 978-0-19-501476-1. Lasswell, Harold D. (April 15, 1971). Propaganda Technique in World War I. M.I.T. Press. p. 268. ISBN 978-0-262-62018-5. Huxley, Aldous (1958). Brave New World Revisited. New York: Harper & Row. Andrew, Christopher; Mitrokhin, Vasili (September 20, 2005). The World Was Going Our Way: The KGB and the Battle for the Third World. New York: Basic Books. p. 736. ISBN 978-0-465-00311-2. Andrew, Christopher (March 1, 1996). For the President's Eyes Only: Secret Intelligence and the American Presidency from Washington to Bush. New York: HarperPerennial. ISBN 978-0-06-092178-1. Riedel, Bruce (March 15, 2010). The Search for Al Qaeda: Its Leadership, Ideology, and Future (2nd ed.). Washington, D.C.: Brookings Institution Press. ISBN 978-0-8157-0451-5. Clark, Charles E. (2000). Uprooting Otherness: The Literacy Campaign in Nep-Era Russia. Susquehanna University Press.